Orx has a very powerful config system that can allow you to define all objects, onscreen positions, lists for tiles, screens or anything else you can think up. In this way you can create level maps for your game very easily. But it can be labourous, especially with lots of mapping data and not so simple to make tweaks here and there. Sometimes it is nice to have your map defined as an array in your own code and to generate the needed objects onto the screen. 1) Define a config file for your tile graphics and object template. 2) Dynamically place objects on screen as dictated by an array of index values. 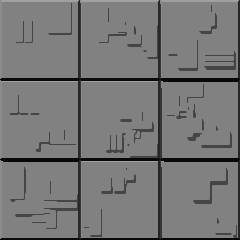 I have provided a set of tiles for this tutorial here. They're rough but they'll do for illustration purposes. Each tile is 80 x 80 pixels on a 240 x 240 pixels sized graphic. Save to the data/scenery folder. Graphic		= tile1; This will do as a default. The following variable is there to say what position in the array we start painting our tiles from. Fairly self explanatory, but the method takes an index which is start position in the array to paint from. Next, the size of the array is checked to make sure the passed index is not out of range. An object is created each loop pass using [TilesObject] in the config as a template. This is preferred to orxObject_Create. Saves a lot of manual effort. Next, a graphic object is created and the name passed is a combination of tile + 'map value'. This will give us the correct name pulled from the config, eg. tile4. Finally, the graphic structure is linked to the object structure and then positioned. And that's it for painting. Now we need way of clearing the objects if we want to repaint the map in a different starting index position. This routine loops through any objects that are named “TilesObject”, get's the graphic that is linked to it, deletes the graphic and then the object itself.